Hello! How is your 2015 so far? Mine has been fabulous. I've been super-motivated to get my apartment in shape. It's been driving me bonkers, so a new year felt like the perfect reason to refresh my living conditions, my wardrobe and my personal health! I bought some new jams (Sam Smith & Nicki Minaj) and I've been cleaning up old projects & organizing closets; I took a bags of stuff to Value Village and Buffalo Exchange, and now I'm focusing on inner and outer health. As always, I'm a huge proponent of organic beauty products. The more natural, the better! This latest Brand Backer campaign I've signed up for involves some generously-sized samples from InstaNatural. Over the summer, I fell in love with Josie Maran Argan Oil, but at $48 for 1.7oz., her product is not something I can afford to buy all the time. 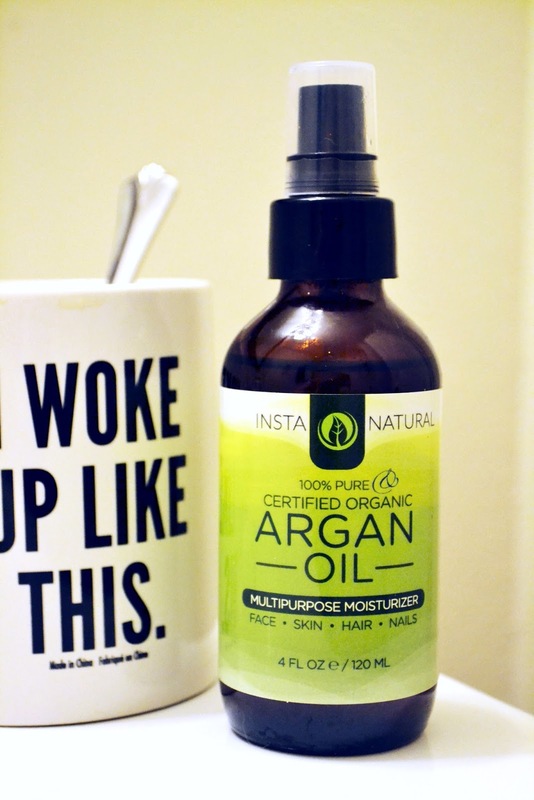 While InstaNatural's Argan Oil isn't as glam as something from Sephora (I got it through Amazon), it's just as naturally good for your skin, and the earth, as any other brand. (Or so the site claims). It's certified organic and you get 4oz for $19! That's a crazy-good deal. The one downside is that it has a weird smell. It's cold pressed and unrefined, so you're getting pure argan funk. The smell doesn't last, though, and with use, I'm getting accustomed to it. I use it all the time. It's perfect for my sensitive skin, so I wear it under my make up. I also use it as a hair conditioner, pre-blowdry hair smoother, body lotion, bath oil, etc. etc. And I have so much of it, I don't mind sharing anymore! The company also sent me a giant tub of their Argan Oil Hair Mask. It's super thick and smells like orange creamsicles. You're supposed to leave it in for 5-15 minutes, but I rarely have that much time in the shower, so I reserve it for my weekend baths. My hair has certainly felt softer and has been very shiny. I just have to be careful to thoroughly rinse everything, or else I'm left with hair that's a touch too shiny, if you get my drift. I wouldn't recommend it for fine hair, unless it's processed (permed or bleached). It doesn't seem to strip the color from my hair, which is another plus, but the product description doesn't say anything about it being color-safe, so be careful if you color yours. A clean apartment, soft, healthy hair, some new accessories and new (thrifted) duds, and I'm ready to take on the rest of 2015! I can't believe how little Otto was; he's so long and tall now! Shipley & Halmos' "We're An American ______"
Copyright 2014 by Fleur d'Elise. All rights reserved.